If cellulite, loose skin, and stubborn fatty deposits are resisting your best health and skincare efforts, costly surgery is not your only option for restoring your youthful appearance. JuVaShape™ offers a safe and effective non-invasive alternative for cellulite removal, body contouring, and skin tightening—with visible results in a single session! The JuVaShape™ laser’s breakthrough technology allows for customized targeted treatments to address a range of cosmetic concerns, from sagging skin on your face and neck to exercise-resistant fat in your belly. Whether you’re getting red-carpet ready for an upcoming event or just want to get rid of cellulite and diminish the signs of aging, JuVaShape™ can help you achieve your goals without going under the knife. The powerful and highly effective technology of the JuVaShape™ laser uses radiofrequency (RF) energy to minimize wrinkles, tighten sagging skin, eliminate cellulite, and blast stubborn fat. Featuring a Dialectric Heating mechanism, the JuVaShape™ laser technology allows for the safe, deep heating of tissue at different depths of penetration while the surface of the skin remains cool for a comfortable and soothing experience. When used to target cells in the dermis and epidermis (upper layers of your skin), the JuVaShape™ laser’s thermal energy stimulates the production of new collagen, giving your skin a tighter, more youthful appearance. At deeper levels of penetration, the laser heats and destroys fat cells found in the hypodermis, beautifying the contours of your face and body. 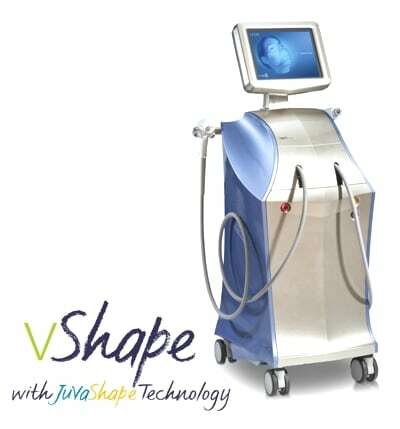 If you’re looking for the best skin-tightening and laser body-sculpting treatment available, JuVaShape™ is the one! Prior to your first JuVaShape™ session, we’ll sit down with you to talk about your concerns and goals. When the procedure begins and our technician glides the laser over the treatment area, you can expect to feel a light vibration and a warming sensation with each pulse. Most people find it comfortable and comparable to a spa massage. Depending on the area of focus and your specific concerns, the procedure takes 20-45 minutes, so you can be in and out of our office and back to your normal routine right away. Although you’ll notice a difference after your first session, most people need six to eight treatments for optimal results. The effects from our JuVaShape™ treatments can last anywhere from one to three years. Our goal is to help you look and feel your best. JuVaShape™ is an affordable, non-invasive, and highly effective solution to wrinkles, sagging skin, cellulite, and stubborn pockets of fat. Contact our exceptionally trained staff for answers to all your questions about JuVaShape™ and the other cosmetic treatments we provide. For more information or to schedule an appointment, contact Siti, San Diego’s premier Med Spa at (619) 717-8484. Need to reduce cellulite and contour your body shape? JuvaDerm is a cutting edge radiofrequency treatment that can target problem areas and restore a youthful look.